The PERFECT heart-healthy salad for picnics, BBQs, or travel! 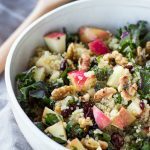 Quinoa, kale, toasted walnuts, juicy apples, and cranberries are tossed in a cider vinaigrette for a super tasty main dish or a delicious side dish. Naturally gluten-free and vegetarian. Bring quinoa and water to a boil in a medium saucepan. Cover, reduce heat to low, and simmer for 15 minutes. Turn off heat and let sit with lid on for 5 more minutes. Then remove lid, fluff the quinoa with a fork, and allow the quinoa to cool to room temperature. While quinoa is cooking, prepare the cider vinaigrette by placing all the vinaigrette ingredients in a jar with a tight fitting lid. Shake vigorously until combined. Once quinoa has cooled to room temperature, in a large bowl combine quinoa with the chopped kale, chopped apple, toasted walnuts, dried cranberries, and cider vinaigrette. Marvel at how simple this recipe is.